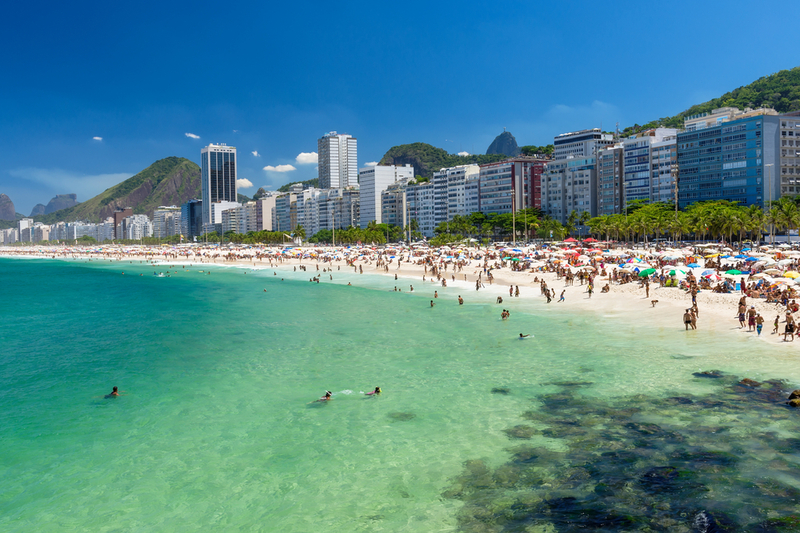 The iconic hotel Copacabana Palace sits directly across from one of the worlds most iconic beaches and right in the middle of the action of the vibrant tourist district of Copacabana. The hotel was built in 1923 well before the beach came to world fame. In fact, when the hotel was built it was the only building in Copacabana, and it was built as an exclusive beach retreat for international guests and wealthy Brazilians. The Art Deco hotel was designed by French architect Joseph Gire. With the growth of Rio de Janeiro the city expanded and with the construction of tunnels beneath the hills that kept Copacabana separate from the rest of the city, the population grew. The hotel itself is rated five stars and has 239 rooms. This iconic property has had guests such as Madonna, Michael Jackson, Justin Bieber, Robbie Williams, Walt Disney, Rolling Stones, Elizabeth Taylor, Elton John, Marilyn Monroe, Rita Hayworth, Brigitte Bardot, Diana, Princess of Wales, Queen Sonja of Norway, Luciano Pavarotti among others stay between its famous walls. The opulent decorations of the hotel do make you feel you have been whisked back in time to another day and age, and expect one of its most famous residents Bridget Bardot to walk around the corner at any minute! This hotel is a very good option for those looking for a deluxe option in Rio. With a selection of fine dining, luxury pool and excellent service it is well suited to the luxury traveller. The hotels suites have all the mod cons, luxury linens and large oversize bathrooms, as well as fine period furniture and original works of art. The hotel includes a half-Olympic-sized swimming pool, Copacabana Palace Spa, fitness centre and rooftop tennis. Sitting across from the beach, the hotel also has its own secured patch of sand, complete with towel service, beach chairs, refreshments and security. It’s a fantastic place to watch the world go by and all the colour of Brazil’s world famous beaches. The hotels spa offers a range of services which are best booked prior to arrival to guarantee availability at your desired time. If travelling during Rio carnival, be sure to buy a ticket to the world famous carnival ball, which is held at the hotel. This black tie affair is perfect for those who really want to experience carnival at its by best. Tickets do sell fast though, and are strictly limited. For more information see our blog here about carnival. For more information on this hotel and other Rio and Brazil hotel options please contact us.